If you've been creating web services in PeopleSoft, there will most likely be at time where you will need to significantly modify or remove a web service. 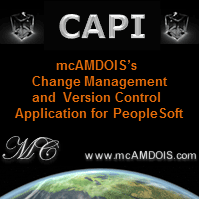 Fortunately, PeopleSoft have provided a ways to manage web services (WSDLs). Search for your existing service (just hit search if you don't know what it is called). Select the appropriate service, press Next. The first page (tab) allows for you to search for and delete the WSDL associated with a service (which was been provided as a web service). Note in PeopleTools 8.50, there is also a hyperlink to Clear WSDL Export Status which used to find and resolve inconsistencies with WSDL exported to the WSDL repository. It is essentially a tool to find and fix service operations without an associated WSDL which have been provided as web services.